Safety Hero Julie Bennett began her career as a safety professional because of her passion for helping others. With an Air Force and Reserve background, Julie entered the civilian workforce as a risk manager for a regional staffing firm. This is where she found her passion – helping others to stay safe. Receiving an Occupational Health and Safety Degree from Eastern Kentucky University, Julie progressed throughout the safety ranks. 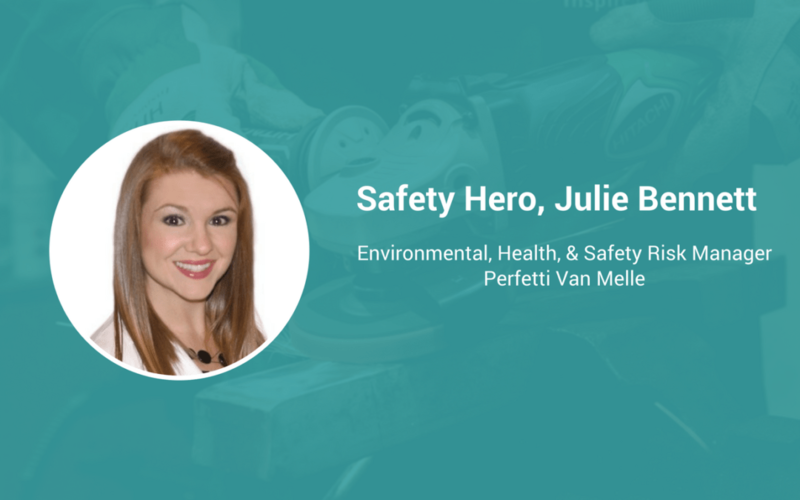 Currently, Julie serves as the Environmental Health and Safety Risk Manager for Perfetti Van Melle. She’s also pursuing her Law Degree from Northern Kentucky University’s Chase School of Law. I have a passion for helping others. I found that out during my first job where I was working as a risk manager for a staffing firm. My job was to help keep the temporary works safe. I saw first-hand how dangerous sites could be, and how rough conditions could be on the “front-lines” and I wanted to make a difference. Perseverance and resilience. That’s my motto. Every safety professional faces the need to do “more with less.” We, as safety professionals, are the ones that have to remain calm when things are going wrong. We have to be resilient when things aren’t going our way, and we have to be able to persevere through challenges in order to improve the overall result. There was one event that heavily impacted me early in my career. The organization I was working for at the time was improperly using a forklift attachment to load and unload large steel rolls from a truck. I knew it posed a potential safety threat so I brought it to management’s attention. No action was taken for some time, so I’d occasionally remind them. Then one day, they finally decided to purchase the proper equipment. That same day, the forklift’s attachment broke while loading a large roll into a truck crushing a young employees foot. If I had been more persistent, I feel that I could’ve prevented the accident. Now, I’m never scared to speak up and be persistent when I know something needs to be done. It’s not just the employees you’re trying to protect, it’s everyone that loves and cares about that employee; everyone that depends on that employee. There are so many families out their that depend on the safety of their family members. Our job is to protect the employees AND their families. I’m very analytical, and I’m tech-savvy. I use that technical capacity to highlight and analyze potential issues before those issues cause problems. Doing that as a practice results in an increased ability to improve safety through prevention. I would like every person within a company – from the CEO to the hourly employee – to have a safety development and training plan. A plan that is unique to their role and that highlights the importance of safety to them, and the company as a whole. Ultimately, this type of approach would improve safety awareness, safety culture, and accountability.